The Los Angeles Dodgers celebrate after Game 7 of the National League Championship Series Saturday in Milwaukee. The Dodgers won 5-1 to win the series and will face the Boston Red Sox in the World Series. MILWAUKEE – Yasiel Puig and Cody Bellinger flexed their muscles. Chris Taylor flashed some leather. 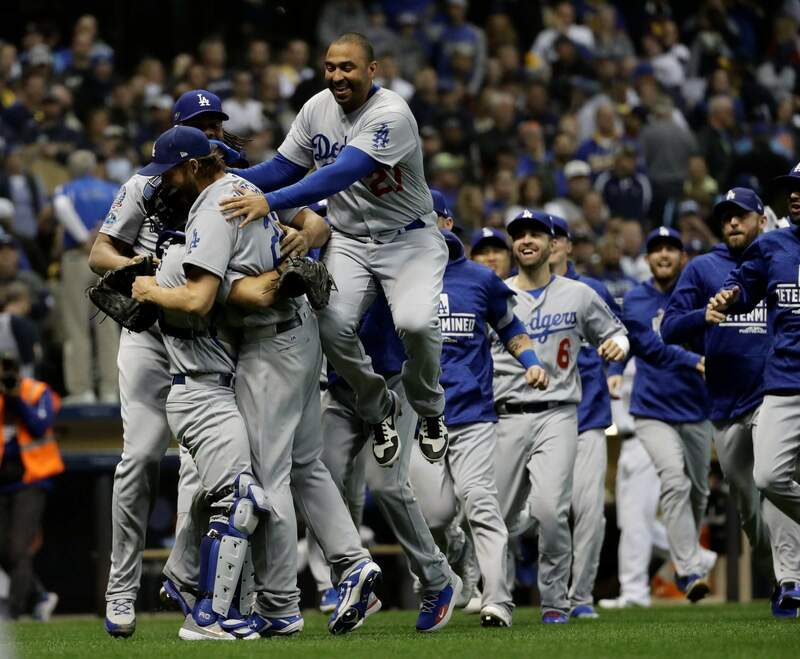 Puig broke open a tight contest with a three-run homer in the sixth inning, Taylor robbed Christian Yelich with a super catch and the Dodgers took Game 7 of the NL Championship Series with a 5-1 win on Saturday night. It’s off to Fenway Park for a showdown against the Boston Red Sox in Game 1 of the World Series on Tuesday. “It’s pretty cool. It’s going to be a pretty special series,” said Bellinger, chosen as the NLCS MVP. Los Angeles hasn’t won the World Series since 1988. The Dodgers and Red Sox have met once before in the World Series, back in 1916 with Boston beating Brooklyn behind a big game from pitcher Babe Ruth. Kenley Jansen tossed 1 1/3 scoreless innings before yielding to Kershaw in the ninth. The three-time Cy Young Award winner, pitching on two days of rest after starting Game 5, finished off the Brewers by striking out Mike Moustakas in a perfect ninth. Kershaw’s teammates mobbed the lefty near the mound after the final out, and the celebration was just beginning for the Dodgers. “I’m just so proud of our guys for enduring this roller coaster of a season,” manager Dave Roberts said. What a surge for a team that was 10 games under .500 on May 16. The Dodgers have talked about having unfinished business after losing Game 7 of the World Series last year to the Houston Astros. Now they’ve made baseball’s final series of the year in back-to-back seasons for the first time since 1977-78. “I know how lucky I am to be a part of it two years in a row,” Bellinger said. The Brewers had their chances against rookie starter Walker Buehler, a 24-year-old right-hander who navigated through trouble over 4 2/3 innings. He allowed six hits, including a home run in the first by Yelich that made it 1-0. Yelich looked like he would hurt the Dodgers again in the fifth with Lorenzo Cain on second with two outs. The NL MVP candidate hit a high, hard liner to left that seemed destined to fall in for a double. Running at full speed to his left, Taylor extended his glove high in the air just as the ball settled into the mitt to end the inning. “They made the plays, they made the pitches when they had to (make) to win,” Yelich said. AFTER HADERThe Dodgers waited for lights-out lefty Josh Hader to leave the game to get their bats going again. Brewers manager Craig Counsell brought in Hader in the third after starter Jhoulys Chacin allowed a two-run homer to Bellinger in the second for a 2-1 lead for the Dodgers. Hader tossed three shutout innings, striking out four before being pulled after 31 pitches. Milwaukee’s vaunted bullpen then scuffled in the sixth. Puig’s three-run shot off reliever Jeremy Jeffress quieted the breathless, screaming Brewers fans at Miller Park. Puig had been hitless in his previous five at-bats against Jeffress, striking out each time. POWER PACKEDThe excitable Puig raised both arms as he rounded second, wiggling his fingers skyward to mimic the Brewers’ trademark celebration move. Manny Machado, the object of nonstop boos from Milwaukee fans, obliged with the same gesture as he watched from the dugout steps. Bellinger raised his right arm and pointed to his biceps as he rounded third after his homer. The mighty Dodgers, who hit an NL-best 235 homers, outslugged the Brewers, who were second in the league with 218. WHAT A CATCHTaylor said that it was so loud in the outfield that trying to communicate with Bellinger in center while tracking Yelich’s liner in the gap in the fifth was difficult. It was about reacting at that point, Taylor said. “A lefty hits it in the gap, it kind of tails. You really don’t know how much that ball is going to tail. So really, it’s just a reaction play,” he said. LOOKING FORWARDThe loss ended a remarkable year for the Brewers. A late surge led by Yelich lifted Milwaukee from 5 1/2 games out of the NL Central lead on Aug. 28 to one win short of the franchise’s second World Series appearance. An American League team in 1982, the Brewers lost the Series in seven games that year to the St. Louis Cardinals. Game 7 against the Dodgers was the first at home for the franchise, coming 36 years to the day after losing the seventh game to the Cardinals in the Series. With Yelich and first baseman Jesus Aguilar emerging as offensive cornerstones, along with a deep well of young pitching in the majors, the Brewers figure to contend again in 2019. They’ll have to dethrone the Dodgers.